'Syd, a headstrong 'stubborn' young collie who pulled on his lead, has a passion for chasing squirrels and his nose into everything, is still all of these things but through patient coaching from Sharon at Angelic Dogs he will walk to heel when asked, prefer a game of chasing leaves with me and when told to 'leave it' will. 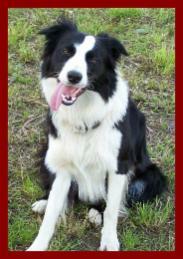 We first took Syd to obedience classes building a foundation for communication between us and our dog. Angelic Dogs helps humans understand why dogs react to certain situations by showing us the dogs point of view. Through training both of us, a relationship has formed and I can now read Syd's body language and have an understanding of when he is stressed and can diffuse the situation. Through agility classes Sharon opened up the possibilities that you can teach a dog anything through patience and rewards, with amazing results and although we have never competed, his agility training has been useful for his everyday walks as he understands different commands. Angelic Dogs has also offered us valuable support at difficult times. When Syd broke his toe and was driving us crazy with his pent up energy Sharon provided an alternative training program that rested his feet and exercised his brain power. Sharon has also conducted excellent one on one training sessions. If you were to see her sitting in the boot of my car and trying to encourage two young puppies, terrified of the car, to jump in, you would understand her dedication. 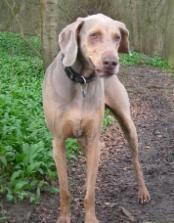 'I have a very energetic and boisterous Weimeraner called Murphy. Although his walks would allow him to release his energy I wanted to give him some mental stimulation, preferrably via something I would also find fun! So I hit the internet and found Angelic Dogs training school and enrolled for a course of agility lessons! I was quite apprehensive when we first started having lessons, as I wanted Murphy to behave and do what I asked of him straight away. Of course, Murphy did not oblige...!! Sharon supported me greatly throughout our sessions and taught me to understand why Murphy behaved in certain ways and subsequently, how to deal with that behaviour! Sharon was extremely patient and I soon learnt that Murphy's more undesirable behaviour was often as a result of the mixed signals I was giving him! 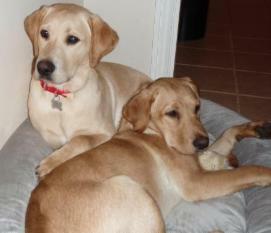 It wasn't long into our course that I began to relax and Murphy soon began to learn my commands. This in turn, increased the bond between me and Murphy, which I cannot thank Sharon enough for. We were sad to see her move abroad! Despite this move however, Sharon has remained at the end of the email and has always offered first class advice/support with any 'doggy' issues we have come across! 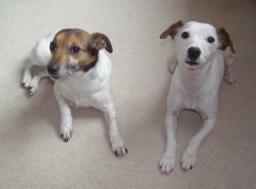 'We started working with Sharon in 2006, in the hope that she could help us to become better and more unserstanding owners of two lively Jack Russells - Jazzy and Dylan. We'd undertaken puppy socialisation classes and basic obedience with both our dogs when they pups, but an accident involving a bike had made our youngest dog- Dylan - extremely fearful and typical of a Jack Russell this was being exhibited as fear-aggression when out and about on walks. We'd endured this for a number of years by making all the wrong decisions - avoiding other dogs, children, bikes etc! This clearly led to exacerbating Dylan's fears and started to rub off on our older dog - Jazzy. We contacted a number of Canine Behaviour specialists, but immediately on talking to Sharon, we knew she was the one we wanted to work with. Sharon did not baulk at the size of our problem and most importantly for us, she did not make us feel that we were awful owners. Her supportive and gentle approach ensured that we would work closely with her for 3 years (until she moved to Portugal, a very sad day for us!). The moment Sharon met our two little livewires, we could see that she understands dogs completely. They connected with her instantly and there were immediate changes in their behaviour when she was present. Sharon taught us how to have fun with our dogs again and showed us the brilliance and easy of clicker training as part of a positive approach to shaping rather than forcing new or improved behaviours in our dogs. Sharon was completely committed to our family from the outset and would do everything possible to fit in with our lives - so we had one-to-one training in our home, around our local walks and on the field behind Sharon's home. Once Dylan was ready to watch other dogs in a class setting, Sharon set up a little area just for him, so he could be socialised from a distance. She was honest in her hopes for Dylan's progress in the future and we knew that it would be a lot of hard but rewarding work to help him have a happier and less fearful experience of the world outside our home. Mike, Natasha, Dylan and Jazzy.